So long McMansions and rambling square footage, small homes are in! Easier to maintain and more affordable in hard economic times, small houses are gaining popularity in the housing market after nearly 60 years of trending up in size. 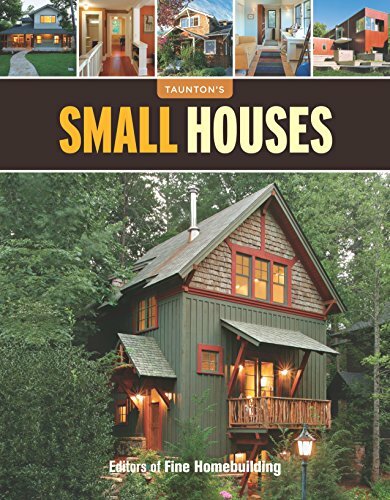 Small Houses capitalises on this shift with an all-new collection of small houses from Fine Homebuilding magazine. The featured writers, well-respected authors in their fields, look at houses, ranging from less than 1,250 sq. Ft. To upward of 2,250 sq. Ft., that are both new and remodeled, urban and rural, traditional and modern. Homeowners will be pleasantly surprised that these small homes are big on charm, style, and quality, and offer all types of exciting possibilities and energy efficiencies to mesh with and improve their lifestyle. Fine Homebuilding magazine is the most respected residential design and construction magazine in the country. Since 1981, it has been providing information and inspiration to everyone who cares about quality home improvement, renovation, and construction. www.finehomebuilding.com.